Looking for a date on V-Day? The time leading up to Valentine’s Day is often filled with stress and anxiety – whether you have a partner or not. Kennedy Library to the rescue! The Take5 team (the library’s outreach program that also brings Therapy Dogs and Watercolor Wednesday) presents a no-stress Valentine’s week. 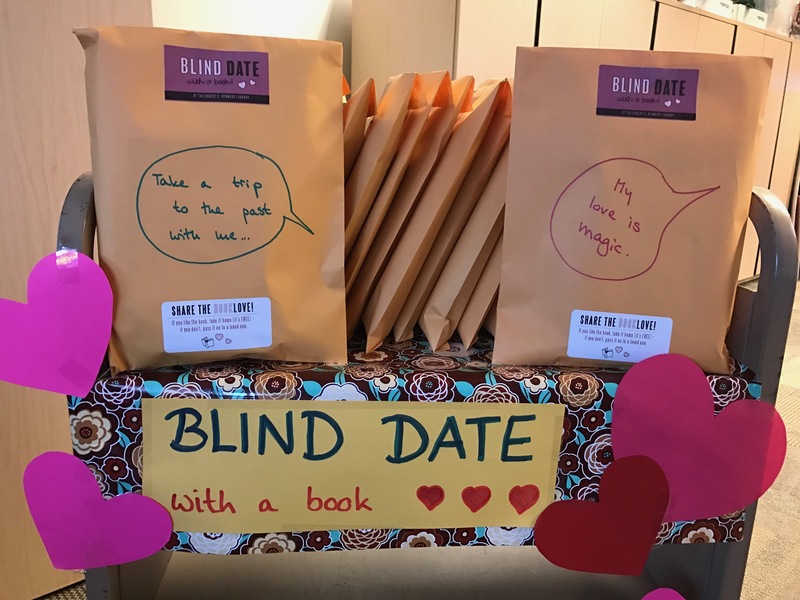 De-accessioned books from our good reads collection are hoping to find a new home, disguised as your “blind date”. Wrapped in an envelope, you will only be able to read a short hint about your book date. “Take a trip to the past with me.”, “My love is magic.”, “Defending love against all obstacles.”, “Save the world with me!” are some of the teasers written on the 80 books that are given away for free. You can also send free Valentine’s greetings to your friends and family. The library’s design team student assistant Shania Cheng created postcards that are available at the front desk. Fill yours out and drop it into the box before Monday, and the library will mail them out for free – just in time for February 14. “It’s an easy way to de-stress and take a break from studying,” Liegl said. Take5 actively works to provide students with free activities to help manage and reduce excessive stress. ‹ Collaborate and study at Kennedy Library!